Experience the thundering sounds of some of the fastest, most exclusive super cars in the world! 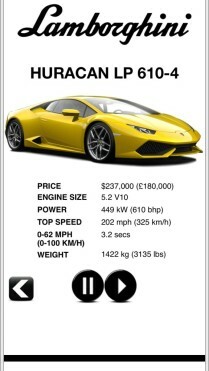 Listen to over 190 different sports cars from the Lamborghini Reventon to the Pagani Huayra to the Bugatti Veyron! Any super car you can think of is just a tap away! 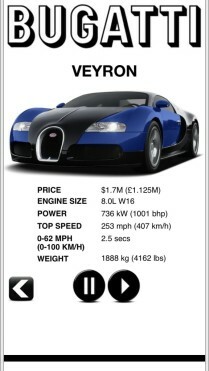 This is truly the most epic car engine sound experience on your iPhone and iPad! A superb collection of brands including Aston Martin, Bentley, Bugatti, Ferrari, Lamborghini, Koenigsegg, McLaren, Pagani and much more! Listening to the actual engine will send the adrenaline flowing through your veins and your hearts tachometer will be red lining for sure! Sports Car Engines is a car lover’s dream! Music to my ears – This is such a great app for super car lovers like my self the sound quality is perfect, and the cars are awesome! Very well done!